Amy, a a quiet, shy 15 year old, gets romantically involved with one of her teachers. 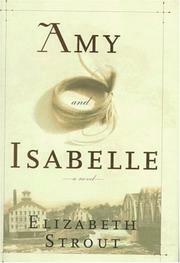 Isabelle’s boss, Isabelle is Amy’s mother, discovers the relationship and tells her mom. Although a simple story on the surface, the novel is beautifully written, delving into the emotions of all the characters. I really enjoy Elizabeth Strout’s style of writing and looking forward to reading her new book that just came out.